A build/release task for scanning the IP Addresses from the activity of your users on VSTS and comparing those addresses against a known/allowed range of addresses. The intra-document navigation links below are working on the GitHub Page but not on the Marketplace hosted page. You may want to use GitHub Page for reviewing the more detailed documentation sections for easier navigation. 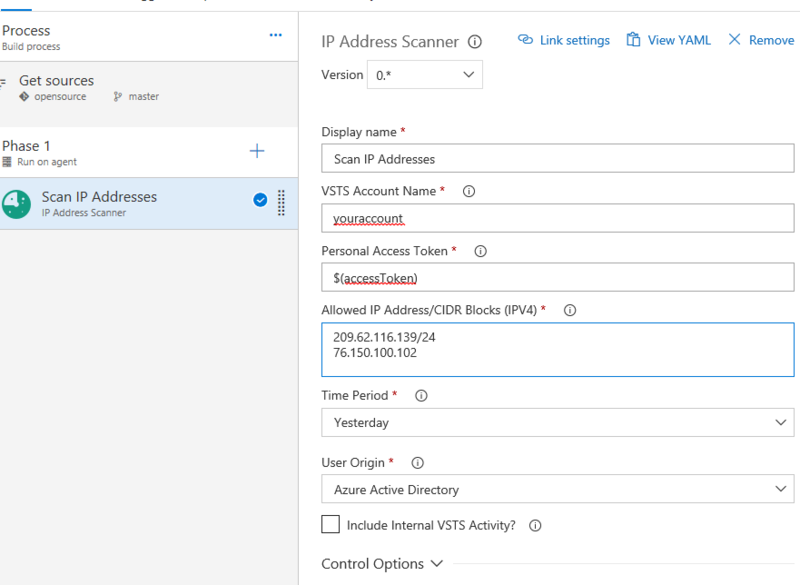 The extension currently provides the ability to scan IP Addresses via a VSTS build/release task which is added to your VSTS account when you install the extension. The IP Address Scanner task will provide information about the scan results and will fail the build/release if anyone accessed the VSTS account from outside the IP range you define. Why is the scanner provided in a Build/Release Task? Note that this extension is currently only available for VSTS. Our thinking was that anyone running their own TFS instance would have far more useful mechanisms over networking, monitoring, controlling access, etc. but if you'd like to see this for TFS (and are willing to help support and test) then feel free to open a feature request on the GitHub repo. We've been running the scanner for several months and have also included some of our usage tips below! The IP Address Scanner has a few key inputs that you'll need to plug your respective values into. This is the token the scanner will use to communicate with your VSTS account. This should be the token of a member of the Collection Administrators group, and we highly recommend you use a [definition variable] to store the value. If you've got more than one VSTS account you will be scanning then we also recommend giving your token access to all your accounts. See the below section for more information about this variable, and the PAT documentation for information on creating Tokens. These are the IP addresses or ranges that you are whitelisting; these are the addresses that you expect your team to use while accessing your VSTS account. All inputs must be IPv4, and CIDR blocks and IP addresses are supported. Enter each address or CIDR block on a separate line (do not add any delimters). 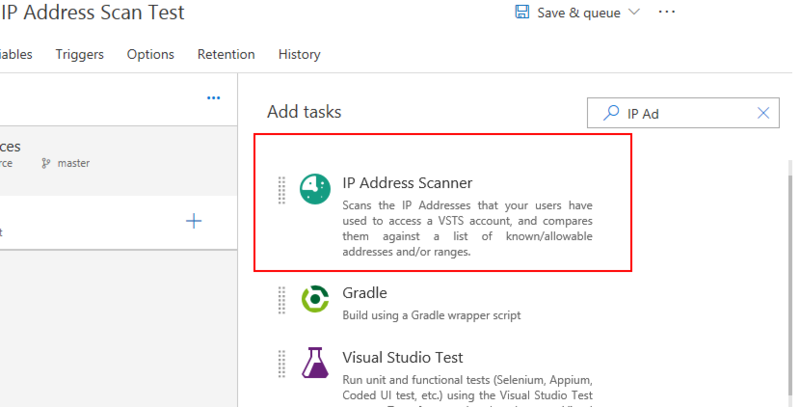 The scanner will look at all the activity on your VSTS account, and will let you know if anyone accessed your account from outside the set you define here. You would typically values here such as the public-facing IP range for your corporate network, public cloud resources (such as any servers where you have build/release agents), etc. This defines the bucket of users in your VSTS account whose activity will be scanned. The default value is Azure Active Directory which means that the scan will review the VSTS activity for all users/accounts that are sourced from the Azure Active Directory tenant that backs your VSTS account. Changing this to All will result in the scan checking the activity of all objects in your VSTS account. This will include any MSA account users that have access to your VSTS account, but also includes other types such as service accounts VSTS uses internally (which you do not care about). We will add additional support for MSA accounts in the future, but AAD was our initial focus. Below is a sample configuration screenshot with random data. Read the additional info on the PAT parameter or jump to the next section. Why does the scan require a PAT input parameter instead of using the OAuth token on the definition? One of our requirements was to support users that own and need to scan multiple VSTS accounts (we've got 15 we have to scan ourselves!). The OAuth token (System.AccessToken) that can be enabled in a build definition can only access the owning/containg VSTS account where that definition lives. If the scanner used the build OAuth token, then you'd have to create a separate build definition in each VSTS account you need to scan. We found it was a whole lot easier to create a single variable group library to manage our configuration (like our IP ranges) in a single place, as opposed to having to maintain your configuration information (like your whitelisted IP addresses/ranges) in multiple places across in each account. We'd happily accept a PR that added optional support to use the OAuth token, but the PAT approach will always be an option. What are the minimum scopes the PAT needs? We haven't had a chance to test this yet, especially since the API's the scanner uses are still in beta too. The scanner is only reading information via two buckets of APIs on VSTS, so we assume the token would only need a couple of read-only scopes. We'll update this once we find out definitively, but feel free to play around with the scopes, and please let us know if you find out! The scanner source code is all open source, and you can review it directly on our Github repo and/or you can use the tfx utility to download the same code from your VSTS account. We've been using this extension for several months, and have included some things we've learned below. Consider creating the PAT with access to all of your accounts if you have more than one VSTS account. Try to manage things as simply as possible! We scan our 15 VSTS accounts from a single Team Project. Use a Task Library to store your IP ranges, tokens, etc., and link it to the different definitions. This way if a token expires, or your IP ranges change, you only have to make the update in one place. Consider having multiple definitions (with different Time Period targets) for each account. You can layer these to get more frequent scans if you want to scan more than once per day. We're going to add some shorter time intervals to support more active-monitoring types of scenarios. Don't panic if your scan flags an unrecognized IP address. When this happens it has almost always been something innocuous. If any unknown IP addresses are discovered during the scanner process, then the scanner will fail the build. Make sure you have your personal and/or team notification settings configured properly in VSTS so that the right people get the notification from VSTS when the build fails (this includes the offending users, IP addresses, etc. but doesn't have all the scanner output, so be sure to look at the build output in VSTS too). After a scan completes, the results will be displayed in the build output. The output will include some supporting information like the parameter values used and usage statistics to go along with result. It is important to note that the scanner is not making any determination about what happened, nor whether it was a simple innocuous event or a malicious user; it is only telling you that it found something outside the configured IP range. It's providing you with information you can use to investigate to make those determinations yourself. However, in our experience, most of our items the scanner has flagged are entirely harmless and can easily be explained. The most common cause is a user working from home connected to the VPN, and their VPN connection will drop briefly, which results in one or two records with their home IP address hitting VSTS. The timing around all the records is also helpful too. For example, was there only 1 flagged record in the middle of 20 records during a 5 minutes period or 100+ records in a row from an unknown IP that were all flagged? We find the AuthenticationMechanism value is also useful in analysis as well. This extension is still in Beta. We've found plenty of bugs already, and we expect there will be more. Additionally, this extension leverages relies on several VSTS APIs which are also still in Beta. Both this extension and the underlying VSTS APIs are very dynamic and experience regular changes, which can disrupt the scan capabilities. If you have a relatively large number of total users (more than ~100-150) in your VSTS account then you should note that there your scan will run noticaeably more slowly than smaller VSTS accounts. Our largest accounts have between 750-1000 users, and the scans for these accounts usually take 45-60 minutes to complete. Another possible occurrence during the scan of these large accounts is that the user account that you specified for the scan (the owner of the token you provided in the task configuration) may also be throttled on that account by VSTS (meaning slowed, but not blocked). In the event the user is throttled, a VSTS-generated email will be sent to that user. You can reach us with any questions, issues, requests, etc. by opening an issue in our GitHub repo or you can send us an email at opensource@swellaby.com if you'd prefer to communicate in private. Why a task you ask? Some of our requirements included being able to schedule recurring scans, recieve email notifications, and to have storage for scan results. Fortunately, the VSTS Build/Release system provides all those capabilities without having to write a single line of code, so we started with the task and will expose these capabilities in other in the future. Initially created by this swell generator!